Who is this guy asking if he can use my photos? I'm glad you asked! My name is Micha Petty, and I am a Master Naturalist that runs L.E.A.R.N. I am passionate about herps and conservation- more info on our staff page here. If I sent you this link, it is because you take awesome photos that I think would help forward L.E.A.R.N. 's Conservation Through Education mission. Good Job! L.E.A.R.N. is a non-profit corporation based in Louisiana. We operate a rescue shelter for reptiles and other pet store type animals. We are also a licensed wildlife rehabilitation center. Mostly, we try to get the public more interested in their ecosystem, with a particular focus on herps. We do this through our website and social media presence, through presentations in schools and libraries and such, through herpetology workshops at our facility or wildlife refuges, through the offering of various educational interpretive graphics, through bulletins on herpetological and conservation topics, and most recently through our free eBook- A Primer on Reptiles and Amphibians. L.E.A.R.N. does not charge for any animal-related activities. We do not charge for wildlife rescues, animal presentations, or educational workshops. We do not even charge adoption fees. The Primer will be a free download under a CC BY-NC-ND 4.0 license. The goal is simply to get people more interested in conservation. That said, it is worth noting that we will likely offer optional print copies of the Primer at some point as a fundraiser. All of the info will always be free to download, but, of course, we cannot afford to print and give away books. Since we would need to charge something, we will probably tack on a small markup and devote any proceeds toward future conservation, rehabilitation and rescue efforts. At no point will funds accrue to any individuals personally. This being a fundraiser for a bona fide non-profit corporation, and considering the eBook is offered for free- we are not viewing this as a commercial activity for the purposes of licensing/copyrights, and we hope others agree with our operating in that mindset. Great pictures really help get people's attention. 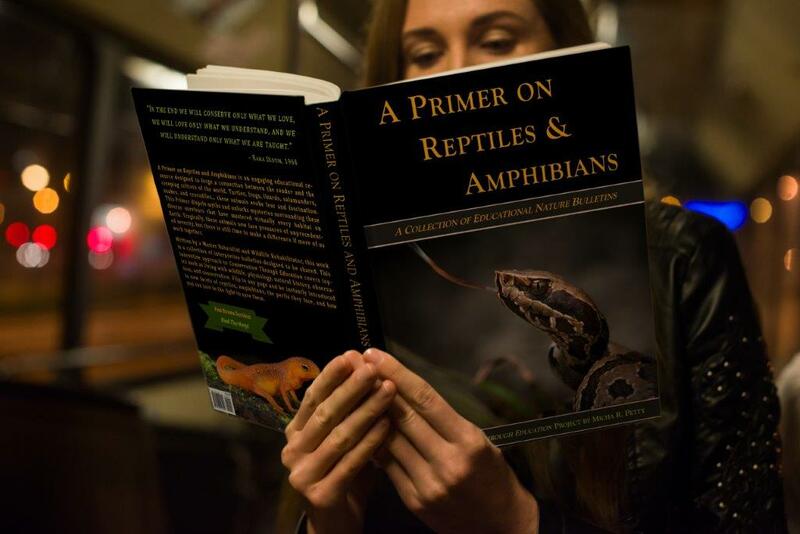 If you have not already been following our efforts- browse around this site, or visit our Facebook page, or the group associated with the Primer- Introduction to Herpetology. I trust it will be quickly apparent where our hearts are at, and that we work hard at our mission of Conservation Through Education. I always attribute the owner on all media usage. Other than the potential fundraiser mentioned above, no money will ever be involved in the distribution of your work. If you prefer, I can run a draft of the proposed use of your work by you before release. If you have a page (Facebook, Flickr, etc.) that you would like a link back to, I am happy to provide that (where practicable, some formats such as captioned graphics do not, of course, lend themselves to external hotlinks). Our works are distributed under a Creative Commons license that requires anyone redistributing them to retain all attribution, and others may not use any of our works for commercial purposes, and derivative works are not allowed (the latter being an attempt to retain the highest level of rights for the contributing authors, while still allowing educators to make use of the bulletins). It is likely that your image may need to be cropped to fit with the formatting of the work it appears in. It will not be retouched or altered in any other way. Given our choice, we prefer images without watermarks. I add the species name and photographers name in a clear but unobtrusive manner to all images. Often, a watermark is already in the exact place where that type would be best placed. If you feel strongly about your watermark appearing, the preferred method is to send us your watermark file and let me replace it after any formatting work is done to the photo. The easiest method for selecting which photos for L.E.A.R.N. to use is to simply share with us the address of your existing online portfolio, and let us know if we may simply pick what we want or make specific requests to you. Amateurs who do not have a portfolio usually just email us photos (in a ZIP file, preferably). An email link appears at the bottom of this page. This might go without saying- but for a photo to be useful, it needs to be well-lit, in-focus and high resolution. We may down-sample the image for certain purposes, but it should start as a print-resolution or better file. While on rare occasions we may be able to commit to a small licensing fee- L.E.A.R.N. is not funded by any government (or other) agency, and really does not have spare funds for that purpose. Unfortunately, we would only be able to pay for licensing in very special circumstances. I hope this is understandable. A note for the amateurs- licensing your work to L.E.A.R.N. for educational purposes does not detract from your copyright. You are of course still free to keep using your images however you please. You are simply granting us permission to also use them for the purposes specified above. You are further allowing folks that want to share our work the right to do so, provided they credit you and L.E.A.R.N. appropriately (usually by simply leaving the existing attribution in place). If the above is acceptable and you still wish to license your work to assist with our conservation mission- Great! You may either reply in like manner to how I contacted you, if applicable (e.g. private message) or shoot us an email. Please include: whether we have carte blanche to select photos from your portfolio or if you prefer to be selective; how you would like your name to appear; and where you would like a link back to point to. Thanks again for your consideration, and Happy Herping!